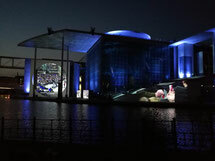 Every evening a film about the history of democracy in Germany is shown on the façade of the Marie-Elisabeth-Lüders-Haus. Every evening in summer you can watch a film for free in the government district and outside in the evening. Every day, when darkness sets in, a film, light and sound projection takes place on the façade of the Marie-Elisabeth-Lüders House near the Reichstag in the center of Berlin. The film "Dem deutschen Volke - Eine parlamentarische Spurensuche. From the Reichstag to the Bundestag". The 30-minute film tells the story of parliamentarianism in Germany and the Reichstag building in Berlin and shows important milestones and emotional events in German parliamentary history. The film begins with the imperial era at the end of the 19th century, follows the parliamentary development in the Weimar period and leads through the darkest period after the National Socialist takeover. It is in German, but with English subtitle. If you want to find more hidden gems of Berlin, check out my folding maps BertaBerlin, QueerBerlin, BeautyBerlin or YogaBerlin map. They are available in well-chosen locations all over Charlottenburg, Neukölln, Kreuzberg, Mitte, Schöneberg and Prenzlauer Berg in Berlin and online. But for those of you, who want to stay up to date, feel free to follow me on INSTAGRAM, FACEBOOK or register for my NEWSLETTER BertaNews.